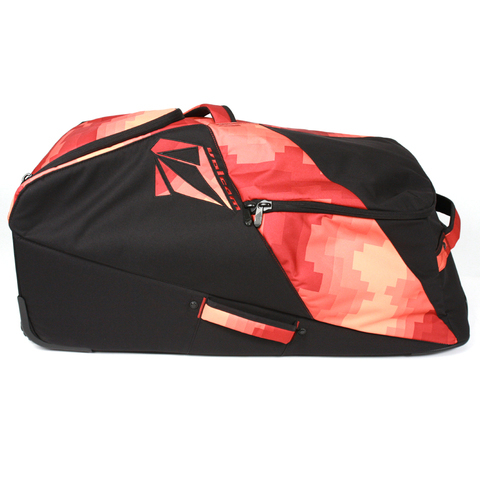 Browse similar Snowboard Accessories by Volcom, clearance Volcom Snowboard Accessories, or click here for all Snowboard Luggage. Do you envision yourself as an international globetrotter? If you do, you had better have the right gear to pull that off. The Hemispheric Check in Roller by Volcom will help you in your lofty endeavors. This durable roller bag is constructed from 51 percent-recycled PET and 49 percent polyester, which makes this bag pretty earth friendly. This roller bag also comes with a retractable handle and other strap handles for easy grabbing, two roomy compartments, and wheels to make it easier dashing through airports. Whether you are heading to some far off land or just home for the holidays this bag will get you there in style.